I never thought I would say this, but I miss the hell out of licensed games. Two of my recent posts have been about old superhero games, namely those of Spider-Man and the X-Men. Some of them were good, others were bad, but we had options. Today, we don’t have many options. I am also not going to say that things were so much better in the past, because there are a lot of great games coming out every week, from AAA to indies. Original IPs are a good thing! The world needs more Hyper Light Drifters and Enter the Gungeons, not less. Also, I understand it would be nostalgia talking if I said the majority of licensed games of the past were great, or even good. Many of them were outright bad. E.T. for Atari was a such a failure that it has been retroactively blamed for almost killing the industry (not strictly true, but a good narrative). Game publisher LJN practically gave the Angry Video Game Nerd a career. In my X-Men article, I highlight the atrocious 1989 Uncanny X-Men, but they also made slime like Silver Surfer, Jaws, and Back to the Future. LJN is notorious, but there is no shortage of bad licensed games. We can’t forget the unholy trash ball that is Superman 64. Remember Superman: Shadow of Apokolips? Batman: Dark Tomorrow? Spider-Man 3? X-Men: Destiny? Iron Man? Thor? Transformers? I don’t miss all of the shovelware and publishers trying to make a quick buck. What I do miss is when talented game devs take a license, understand what people like about it, and deliver great experiences. I miss Spider-Man 2. I miss X-Men Legends II. I miss Turtles in Time. 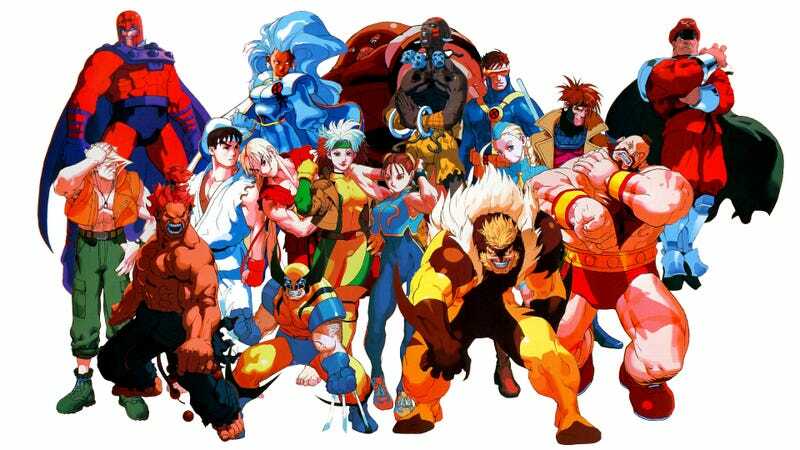 I miss Marvel vs. Capcom 2. I miss the excellent Aladdin and Lion King games made by Westwood Studios. There are a lot of reasons why good licensed games are such a rarity in 2016. For one, modern licensing agreements have greatly cut down on the amount of licensed video games we see. From 1989 to 2000, Capcom, Paragon, Sega, Konami, and LJN all had cracks at making X-Men games. Some were successes, others were failures, but consumers had tons of different options to play games based on these characters. From 2000 on, all of the games were developed by studios under Activision. They started off strong, but a string of critical and commercial failures have seen these games all but vanish. Sadly, X-Men has only seen two home console releases in the past 10 years: X-Men: The Official Game and the disastrous X-Men: Destiny. Even rereleasing the old games we like is a difficult proposition. It took some major legal wrangling to get Marvel vs. Capcom 2 up on XBLA and PSN. Similar licensing issues were a major factor as to why Marvel vs. Capcom 3: Fate of Two Worlds took so long to come out. Now that the contract has expired again, it could be a long time until we see another MvC, if ever. Even when you do have a license, there is a lot more risk involved than in 1995. Games are expensive to make for home consoles, and consumers have more resources available to educate themselves and avoid bad games. Activision can’t just throw “X-Men” or “Spider-Man” on the cover and automatically make their money back. The game industry has no one but themselves to blame for the waste of good licenses. Activision and Sega put a real hurt on people wanting to play superhero console games during the last console generation. Play Iron Man. I dare you. Now take X-Men: Destiny for a spin. Not enough trash for you? Pop in Amazing Spider-Man 2. You can see why people might be a bit leery of the occasional good game like X-Men Origins: Wolverine or Spider-Man: Shattered Dimensions. They’ve been burned before. It is even getting pretty rare to see stuff based on cartoon characters, at least compared to the past. I would be remiss if I didn’t mention the negative influence of the THQ, who made so many cheap and bad kid’s games that it preemptively hurts any game based on cartoon characters. They weren’t alone in doing this, but they were the ones impacted most when the bubble burst. It is a hell of a lot safer and profitable to put these characters on mobile, free to play games like Marvel: Contest of Champions, in a Lego game, or in figure form for Disney: Infinity. There is nothing inherently wrong with any of those things, but they don’t scratch that itch. I really hope I am not the only one who loves the hell out of this game. Here is a personal example: I am a huge Jurassic Park fan. I was excited about the announcement of Jurassic World partially for the opportunity of Jurassic Park games. Maybe we could get a sequel of sorts to one of my favorite park building sims, Jurassic Park: Operation Genesis. Instead, we got the Jurassic World Builder app and Lego: Jurassic World. It’s a damn shame. Any of you that are fans of different properties have probably felt the same way in the last five years. Ironically, there is no better time than now to take advantage of licensed characters. When I was young, superheroes were considered kids stuff or for “nerds”. Now they are the biggest moneymaker in the world. Look at the cash The Dark Knight made! Look at The Avengers! Look at how much money Captain America: Civil War is being projected to make! Even the bad stuff like Transformers and Batman vs. Superman rake in the dough. Where are they all? Marvel and DC are huge in the box office and we got what? A coupla mobile games. Marvel Lego? The Marvel Ultimate Alliance games are great. It’s like X-Men Legends with the entire Marvel universe and I want another one very badly. I’ll never understand why they stopped making the X-men Legends games. Please bring them back. This article really makes me desire a new Xmen game and more superhero games in general. I feel like making a quality superhero game shouldn’t be as difficult as it has appeared to be over the years. Hopefully a developer, other than Rocksteady, will eventually put in the proper care and dedication into creating a quality superhero game. I have many more examples, but you get the picture. Pictured: What can be done with the smart use of licensed characters. There are exceptions. Warner Bros. is far from a perfect publisher, but their licensed properties have been good lately. Obviously, we have the Batman: Arkham series. All four of those games are at least good, with the original and sequel flirting with masterpiece status. Netherrealm’s Injustice was a solid take on a DC fighting game. Lord of the Rings tie in Shadow of Mordor is one of my favorite games of the current generation. Even though it isn’t WB, I would be remiss to not mention Transformers: Devastation, which a lot better than it had any right to be mostly due to its respect for the source material. It doesn’t just have to be WB. They have proven that developers have the technology to make immersive superhero experiences. In fact, some of the bad games I listed are victims to trying to do to much with to little than laziness. If a studio with a lot of talent and passion were given the money to take a crack at a beloved superhero, people would buy it. I certainly don’t want things like Superman 64 back on the shelf, but it would be nice to play a quality superhero game that doesn’t involve Batman for once. Hopefully, someone in the industry has the talent and guts to make it happen.